At KR Dental, we believe everyone should have a smile they’re proud of. If you feel unconfident when laughing or smiling and dream of a whiter, more beautiful smile, then our friendly team can help. Our professional at-home whitening kits can make an enormous difference to a dull and lifeless smile, plus you can achieve your desired results in the comfort of your very own home. We only use the safest and most trusted brands in any of our treatments, which is why we utilise the pola whitening system for our at-home whitening kits. Patients have had highly successful results using this treatment over the years, which is one of the reasons why professional dentists love using it so much. Not only is at-home whitening popular due to its ease of use, but it’s ideal for those who simply do not have enough time to visit a dental practice for a lengthier in-chair whitening session. Your whitening treatment begins with an initial consultation at our practice, where our dentist will take an impression of your teeth from which your custom-made whitening trays are created. These trays are then filled with the whitening gel and are to be worn for short periods of time each day. When our dentist hands you your at-home teeth whitening kit, it contains everything you need for a whiter and brighter smile, along with instructions. While teeth whitening is a safe, long-lasting, and trusted treatment, it isn’t immediately recommended for every patient. During your initial consultation, our dentist will also assess your mouth for any signs of tooth decay or gum disease. 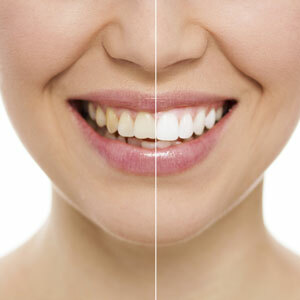 These issues will then be remedied before you begin your whitening treatment. Are you ready to achieve a whiter, brighter, and more confident smile? Our professional team of dentists are highly experienced in all facets of dentistry, including cosmetic dentistry. Please contact KR Dental today to get started on your at-home teeth whitening journey!